Fera is the sister restaurant of Simon Rogan’s L’Enclume (which I reviewed in 2013), an establishment that is amongst the best in the country. In Spring 2014 Fera was Rogan’s first permanent restaurant in the capital and the setting of this iconic Mayfair hotel couldn’t be further from the tiny lake district village where his flagship lies. The dining room is high ceilinged, light, traditional and teeming with suited staff. They offer tasting, a la carte and set lunch menus. We had the latter at £39 with some additional “snacks” for £10 more. That might sound more than you’d usually spend on a snack but these were some of the best canapés around. First a delicate wafer that was so prettily adorned with flowers that it felt a shame to eat. 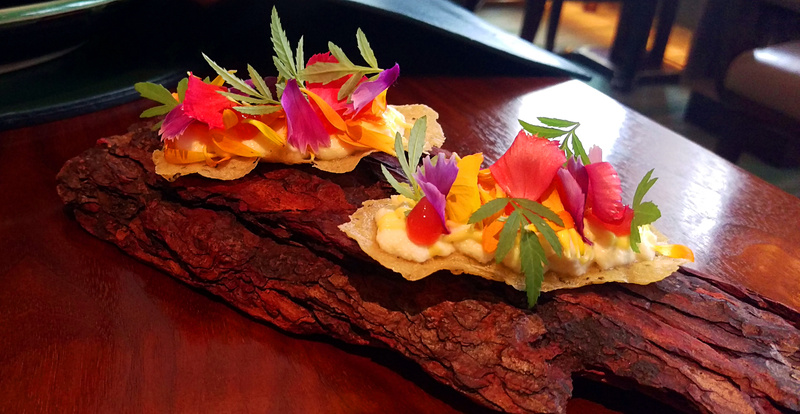 Those flowers were more than just looks, they added little pockets of flavour. Subtle but unique. 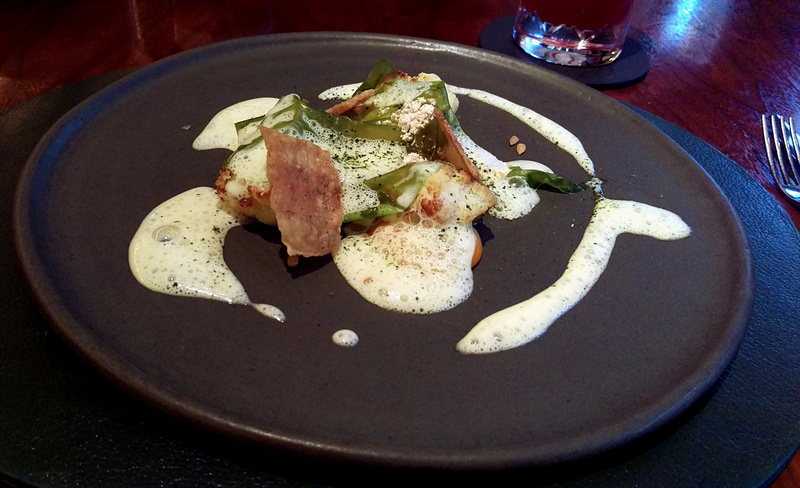 Equally delicate was a seaweed cracker topped with raw lemon sole and sea herbs, a fresh, clean mouthful. In contrast something that slapped you around the taste buds was a little ball of stewed rabbit that was coated in crunchy puffed wheat. Finally, an impressive stone plinth emerged with something bright yellow poking out of the top. It turned out to be sweetcorn puree that sat above a smoked cod mousse, a combination that worked excellently together. Possibly the best £10 you could spend on food? Up there. The meal proper began with a dish of roasted cauliflower. Not everyone’s favourite vegetable but I am a fan, especially when perfectly cooked as it was here. The nutty flavour worked well with some rich egg yolk and saltiness of crispy chicken skin it was served with. The main course was colourful and inviting, certainly from Rogan’s school of presentation. 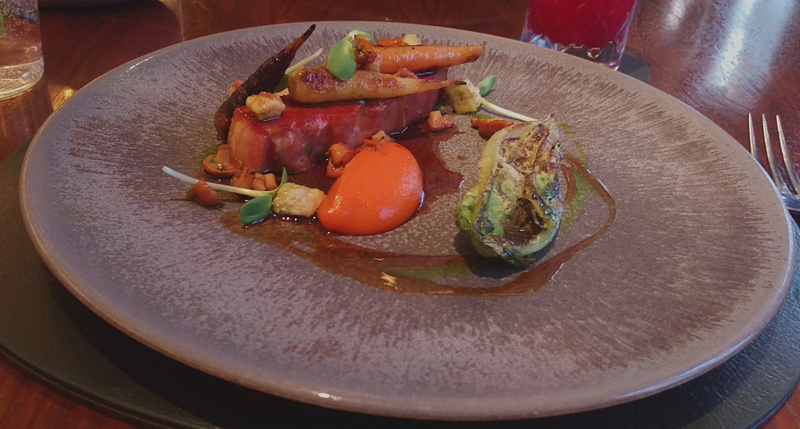 Pork belly came topped by roasted carrots and girolles alongside a carrot puree and lettuce. The sweetness from both incarnations of the carrot provided an excellent foil to the fatty pork belly. A tarragon sauce was excellent and deep in flavour, though can be an acquired taste with the aniseed tang that the herb brings with it. Dessert was a blueberry selection, some poached, some frozen with some white chocolate and buttermilk ice cream. It could have been fresher and more clean in its taste, though overall it perhaps had too many cold elements. With certain mouthfuls the flavour wasn’t as prominent with the temperature of the food. I can imagine you could visit Fera and wonder what all the fuss was about. 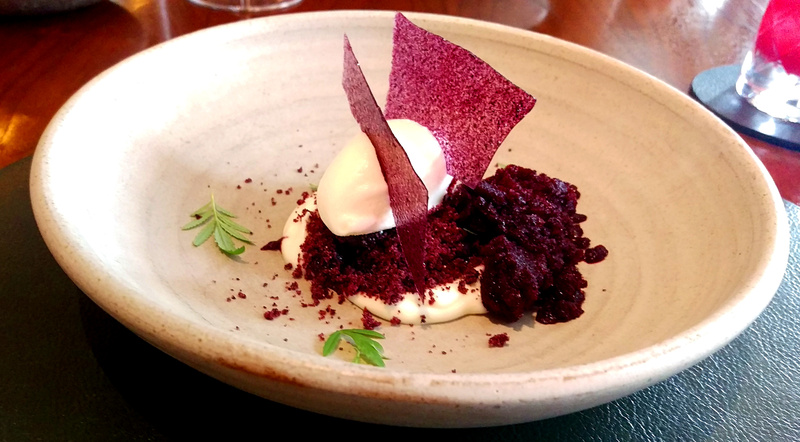 The flavours are unusual, and sometimes challenging, with the unknown ingredients that the foraging philosophy provides. Whilst I didn’t have the full menu £39 in central London is great value for the cooking from the mind of one of the best chefs in the world. It may not have the charm of the Lake District, but it is slightly more accessible!